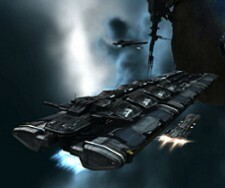 In EVE Online, large alliances of corporations lay claim to the lucrative 0.0 security rating areas of the game and smaller corporate operations generally don't stand a chance against them. Corps who want to claim a little corner of space for themselves are forced to join an existing alliance or compete with them for space. With the recent news of 2500 new star systems coming to EVE with the release of wormholes in the march expansion, small corps may find themselves able to carve out their own little corner of space to live in without being squashed by the big alliances. The information we have so far suggests that wormholes into one of the 2500 new hidden star systems will open randomly in all security levels of system. Wormholes will have a diameter that restricts the maximum size of ship that can enter it and a mass limit that restricts the total mass of ships that can use the wormhole before it collapses. Once the wormhole collapses, the chances of finding another leading to the same system are astronomical so choosing which ships you bring in carefully is a must. Read on as I describe how wormholes could allow corps to more safely own systems and go on to describe what equipment and ships you'll need to take up residence in your own system. Once inside the wormhole system, a ship can scan down new wormholes within that system. There will always be at least one wormhole leading out of a wormhole system and if someone inside the system finds it, they can go through and find out where in EVE it links to. Since you now know the location of a wormhole linking to your desired system, getting pilots into the system is just a matter of travelling there. But since the wormhole could lead to any of EVE's systems including dangerous 0.0 territories and warzones, that journey might prove difficult. The difficulty inherent in getting large numbers of ships into a wormhole system makes them a prize that can't be easily held with simple superiority of numbers. Unlike standard 0.0 systems, a large alliance wouldn't be able to easily invade and conquer entire regions of wormhole systems. This makes them excellent targets for smaller scale colonisation and the perfect place for a corporation to settle in. If a system becomes hostile or someone else is moving in on your turf, you have the option of attacking them or moving to a new system. One of the biggest bonuses for corporate ownership of wormhole systems is how safe POS will be there. 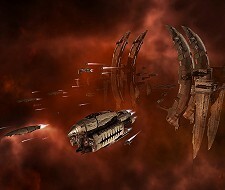 Although sovereignty can't be claimed within wormhole systems, the mass limit of wormholes will make it extremely hard for an attacking force to get a large number of ships in without you noticing. That in turn makes it extremely hard to take down a well defended POS. The down side is that this defensive might comes with a steep cost in fuel that may be difficult to get into the system reliably. If your corp has decided to carve out their own little corner of EVE inside one of the 2500 new wormhole systems, there are certain things you'll need to bring. A small POS is a must-have, along with a month's worth of fuel and ship and corporate hanger arrays. A refinery array may also be handy, as could a factory for building modules or ships. This all adds up to a lot of equipment and you'll need a ship with a large cargo hold to store it all in. The ship of choice seems to be the Orca, the little cousin of the Rorqual. In addition to its role giving mining bonuses, the Orca can carry a couple of spare combat ships in its ship hanger and has an impressive cargo capacity. Most importantly, its mass is only 250,000,000kg, meaning fitting it through a wormhole is going to be a lot more feasible than fitting a freighter or carrier in. The main down side of the Orca is that without a jump drive, you'll need to ensure you use a wormhole leading somewhere safe when you're ready to leave the system. Head to part 2 where I continue to discuss the equipment you'll need to colonise your own system and talk about the massive rewards you can obtain there.